Palmate Newts are sweeter and cuter veriety of newts that are most commonly found in parts of Western Europe. Nowaday’s survival of this species is getting tougher. Infact their lives are nearing extinction in parts of Belgium, Luxemburg and Netherlands. In many countries, there are laws that fortify species. 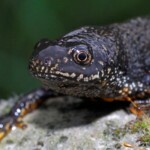 The Palmate Newts in a face graver danger to life in Spain & Poland. This species is known as one of the smallest species. Their larva looks alike the smooth larva. Their names actually signify a palm like shape. This is due to the webbed feet possessed by the male counterparts. Palmate newt is considered one of the smallest of the newt species across the world. The female adults of the palmate newts, look more like the female smooth palmates. Palmate newt really does look beautiful given their glossy appearance. Size : Here the male palmate newts are strikinglysmaller compared to the female ones. When born, their size usually varies between 8 to 10 mm. Color : The color of both males as well as females is very interesting. They are primarily olive green or brown in their basic body color, while their backs are dotted with dark blots. However, these dark patches may not be present underneath the belly portion. Female counterpart comprises of pink colored throat without any dark markings. This help to segregate male and female newt. Body : The male newt always reflects a box like shape. It has two ridges present on the back. During the time of reproduction the male newt, possess a soft crest on the back. The crest appears to be higher near the portion of the tail. It narrows down like a thread near the tip. The male newts also get a large cloak prior to the mating season. Head : A dark line passes through sides of the head and by the eyes. Feet : Palmate Newts have feet that are slightly strange looking. They look similar to the palm of a human hand. The male’s feet are garnished with webbed hind especially while the mating season is on. Tail : They have long tails marked strikingly by an orange line. This line runs through the middle of the body. Their tails look real beautiful with their dotted appearance marked by the rows of dark mottles. 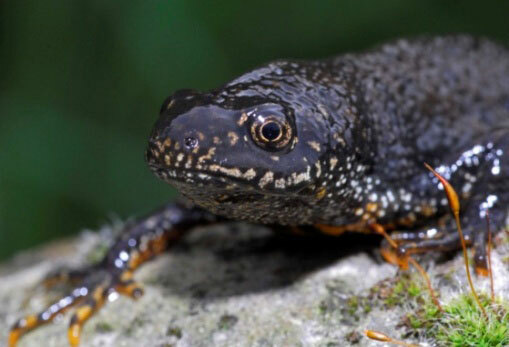 Palmate newts mostly inhabits in the western parts of Europe and the adjoining areas. This species is also found in parts of Wales, Scotland etc. These small and sweet species dwells in lakes, ponds, canals marshy areas and forests as well. They can be easily spotted along the coasts. It is not that these creatures cannot withstand dry climates, however, the always prefer to be in water especially during their mating period. Palmate newts are actually carnivorous. They usually prefer to eat invertebrates, crustaceans small in size and tadpoles. These species reflect some interesting and strange behavior. They are always found active during the nighttime. Even during the rainy days, they remain up and running. It is interesting to note that during the mating periods they are found active throughout the day as well as the night. Palmate Newts always use their tongue to catch the victim taking help of its stickyness. 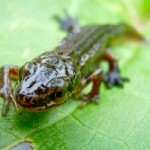 Palmate newt has a very thin body that helps them to make it through the waters very easily. They have small toes that support them to possess a rock or a branch of a tree smoothly during their period of hibernation. Palmate newts thrive on large grass snakes and fishes. Others included in the list of preys are kingfisher, ducks and water flies. 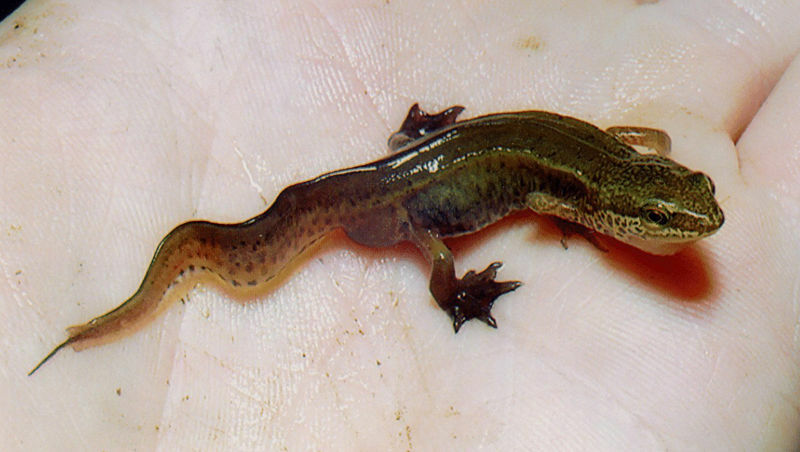 The larger newts prey on larvae. 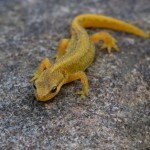 The mating season of palmate newt is mainly between April to May. Newts always mate in water. They achieve their sexual feasibility at the age of 2. After waking up from hibernation, they head towards the pond. They lay about 300 to 400 eggs on an average. These eggs are always found sticking with underwater plants or vegetation. In hotter areas, the reproduction often occurs twice. The eggs of newts usually take 2 – 3 weeks to transform into larvae. After birth, they naturally take 6 – 9 weeks for transformation. In regions of extreme cold, the larvae dwell inside the water. They also have a feathery gill on the outer portion of the head at birth. Post losing their gills, they move out of water and began to live on the land. The hibernation period of the adult newts is from November to March. They usually hibernate in dry areas like rock or stones. They seldom hibernate in water. Their survival period spans on an average for about 10 years. House: In order to pet them, the most important requirement is a large tank. The tank should be such that it is half filled with water and the rest would by land. Floating wood within the tank can double up as places for hibernation for the newts. Foods: You can provide them with worms and other insects. Additional supplements on proteins shall prove beneficial in their sustenance. 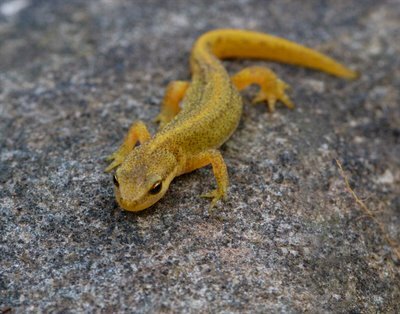 Dealing with Newts: Whenever handling the newts, one should always make sure that the protective gloves are on and the newts are not touched too frequently lest they should get irritated. According to the result of IUCN these species are enlisted in the category of least important and are therefore not endangered. 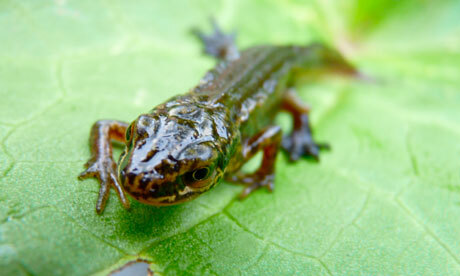 The palmate newt is known to be one of the smallest species of newts. Their names actually signify a palm like shape. 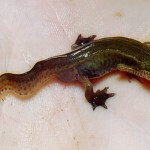 This shape is attributed to webbed feet of the male newts.